Home Specialty Whoopie! April Features! I Want Whoopie! Choose your size – Quickies (about 1½" across) $25 for two dozen (one flavor); Whoopies (about 3" across) $25 for one dozen (one flavor); Whole Lotta Whoopie (10-12" across) $25 per cake. Choose your date. Most orders can be filled with one week’s notice. Send your selections along with your address and phone number to bigwhoop@kurtsmakingwhoopie.com. Payment is expected when you get your whoopie. Have an idea for a flavor combination? Want two flavors of whoopie per batch? Tell me about your favorite tastes or combination wishes and I will come up with a custom flavor/batch. Who knows? 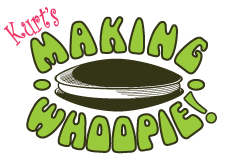 Your whoopie might become my new specialty! The cost is $28 and up per dozen.